“Home made bread 500 gr. Wash the leeks removing any imperfect leaves or any traces of soil. Dry them and cut them into very thin slices with a sharp knife. Boil them for a couple of minutes in a salted and peppered solution of 3 liters water, 500 ml lemon juice, then drain them. 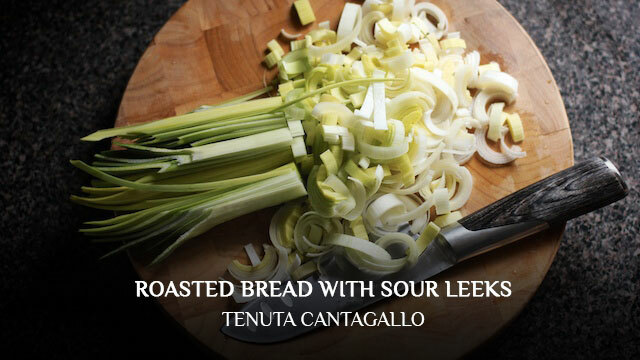 Prepare a pan with same extra virgin olive oil and a clove of garlic ,add the leeks to continue the cooking on a low flame for 15 minutes until they are golden. In the meantime toast some slices of bread and cover them with the sauce, then just before bringing it to the table stir in some more Laudemio.